Yesterday we went walking. We returned to Los Josefos and Cariatiz where, two years ago, we stayed when we first came to Spain to retreat from winter’s worst. I must admit, though, that this wasn’t the plan when we set out. No, we had planned a new walk to an abandoned village set in a landscape of karst. Karst – I had to look it up: exceptional topography full of sink holes and caves fashioned by gypsum, limestone, water and time. This walk had been carefully selected from the excellent Los Mejores Excursiones por las Sierras de Almeria by one Agustin Garcia, then doggedly annotated by one Lizzie Aitchison just in case unfamiliar Spanish words were critical to route-finding and, hence, survival. However, muy rapido the plan was aborted when two attempts just to access the parking area at the start point were thwarted. At the first of these, following Agustin’s instructions to the letter, we bailed out when we encountered an unmade road scored with ruts, themselves as deep as sink holes, that would have challenged the usually splendid suspension of the Peugeot Tepee. The second attempt, tackling it from another direction via some creative map-reading (where is Ordnance Survey when you need it? ), we abandoned when we found ourselves driving through the gates of a gypsum quarry: big yellow barriers, no entry signs, a stream of HGV’s huffing under their load and puffing up unseemly amounts of dust, their drivers honking their horns at us. No, clearly, Entrada Prohibida meant what it said and this walk was not meant to be. But we were near Los Josefos where, back in 2015, we had found some great walks by simply following trails up among the olives and the almonds, over and across the ridges between barrancas, or along dry river beds strewn with rocks. So we parked the Peugeot in the village square at Cariatiz and headed out on delightfully familiar tracks up over the crest of the sierra and down the wide track on the other side meandering along the contours where olives and almonds nestle in small sheltered valleys or on tiny terraces cut into the hillside. There’s nobody in sight; we left all human habitation on the other side of the ridge. Here, there is just nature, the presence of man evident in the husbandry of the trees, the track beneath our feet, and in the moments of history captured in ruined buildings clinging to hilltops. 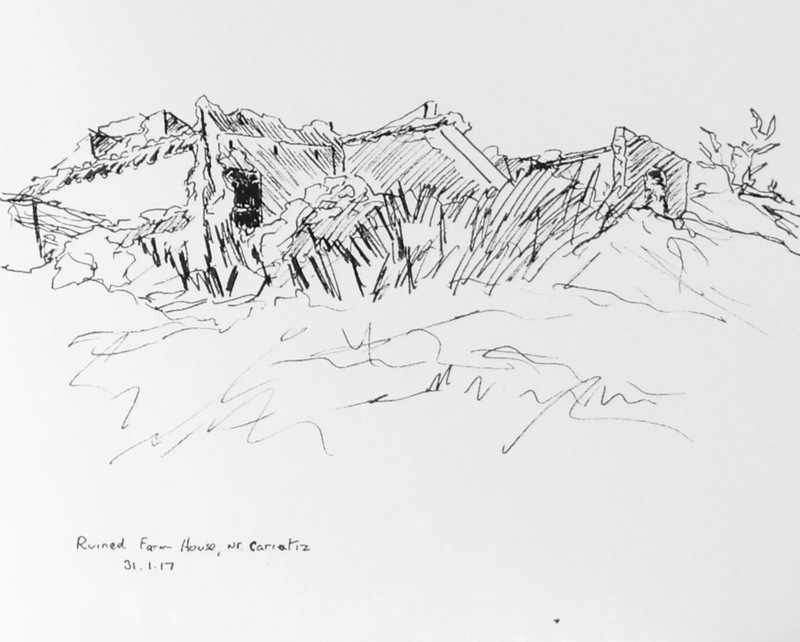 We eat our picnic lunch beside an abandoned cortijo, its walls crumbling but with the odd bit of roof still intact where a local goatherd must bring his animals to shelter, judging by the carpet of dried droppings and the straw piled in one corner. It’s been a while since goats were quartered here – you can usually smell them and their effluent from a few hundred metres but there is no trace of a goaty whiff in the air. The artist is sketching – at last, I hear you say – and the sun is shining. It’s warm. The ground is covered, and I mean covered, with delicate yellow flowers. I don’t know what they are but they stubble the slopes all around with a five o’clock shadow of yellow petals and the bees are having a field day, their harmonious hum like a blanket of sound. A bird, perhaps a local grouse, is squawking on the hillside opposite, a rhythmic dirge, a clattering kind of call as if pieces of hollow clay are being clapped together. Just above him, perched on the hill is another ruin. And out to our right, looking east, the shell of an old cortijo, merging carelessly into the hillside, its walls made from the stone and earth on which it stands, dying a slow death, dust to dust. That’s the thing about these sierras, you hear the echoes of lives long gone, ways of living vanished but the ghosts of dead souls seem to linger somewhere in the ruins. All walks, however short or long they are, are journeys through landscape and biography, fleeting references to old worlds, opportunities to search for the stories of the past. That was, is, a lovely commentary bringing your surroundings into a colourful visual focus…..